As the year 2007 rolls to a bumpy conclusion I can't help but reflect on the events that have impacted on my attention over the preceding 13 moons. Since news first broke of the macabre murder of the pretty Mongolian woman, Altantuya Shaariibuu, the national karma appears to have taken a dramatic dip into a deeper darkness, precipitating a groundswell of discontent and dissatisfaction with the BN government - which has been responsible for governing this country since 1957. 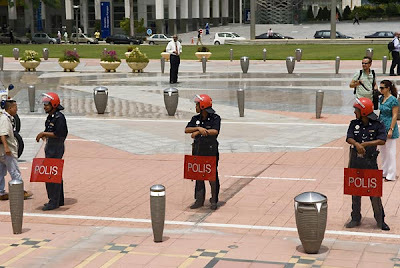 When times were good many turned a blind eye to the clear signs of misgovernance witnessed during Mahathir's 22-year reign as prime minister and president of Umno. While those who ought to know better commended him for his Vision 2020, I found myself diametrically opposed to Dr M's worldview and values. I saw my fellow Malaysians systematically seduced by the promise of western-style industrialization and consumerism ("Look East," Dr M exhorted us, conveniently forgetting that if you look far enough east you'll eventually find yourself looking up your own rear end). I was totally opposed to his policy of "development" at the expense of our natural heritage and humanitarian qualities. Even as Malaysians became more engrossed with the trappings of material "success" they began to lose sight of humbler virtues. In a community of crooks, liars and hypocrites, an honest soul quickly gets left behind as one unfit to survive - such was the Zeitgeist of Dr M's Neo-Darwinian Malaysia. We get the leaders we deserve, they say, and the truth of that seems to have been borne out by the disappointing results of the 1999 general election when BN managed to retain its two-thirds majority - despite its brutal, malicious and vindictive handling of Anwar Ibrahim's sacking and the massive Reformasi Movement that it triggered. 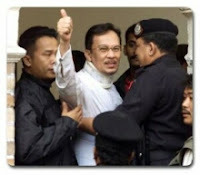 The shameful manner in which the Anwar Ibrahim trial was misconducted made it crystal clear that the Malaysian Judiciary was abjectly beholden to the Executive - and that this had been so since the inauspicious and unceremonious sacking of Lord President Salleh Abas in 1988. And yet the people voted BN back into power in 1999. In fact, it's common knowledge that Anwar Ibrahim wasn't very popular with the Chinese business community - and the Indian voter is easily swayed by anyone who appears to be a strongman - in this instance, Samy Vellu had proven his mettle as a vicious streetfighter over a very long career in the politics of pragmatism. Well, in retrospect, Malaysia would have done well to enter the new millennium on a clean political slate. Instead, the unresolved issues of the previous century continue to plague our overfed bureaucracy. However, it's never too late for change. And going by the renewed resolve of many young Malaysians to continue pressing for a clean-up of the electoral and judicial machinery - without which no other reforms can be successfully implemented - I'm optimistic that a New Dawn is in the offing. Meanwhile, it's extremely depleting and depressing to keep harping on the obscene excesses and the insufferable arrogance of BN politicians. Besides, a few of my fellow Malaysian bloggers have already cornered the market on political scandal. And so I shall change subject completely and share with you a few images that bring genuine joy and a sense of celebration to my heart. FOLKS, MEET EMMA & SUNSHINE! Emma (14) and Sunshine (13) have been friends since kindergarten days. Emma happens to be the only daughter of a very dear friend of mine, John Puracal, who was my classmate in 1967 (when I studied at the Muar High School for six months). Sunshine (whose actual name, Hsing Shan, I find impossible to spell or pronounce) is Emma's best buddy. They recently celebrated the tenth anniversary of their friendship at Magick River. They both passionately love the river and whenever Emma returns from Perth where she's enrolled in high school, she insists that her dad chauffeur them to visit their Uncle Antares. My favorite bathing beauties in all the world! I remember the first time Emma and Sunshine showed up at Magick River. Emma was initially apprehensive about playing in the strong currents and felt impeded by her spectacles - without them she was extremely insecure, and with them on she was constantly afraid the river might steal them. Sunshine was the complete opposite. Without a moment's hesitation she followed my example and jumped 15 feet into the Baby Fall (wonderful fun once you've overcome your fear, but for those who haven't, the prospect is nothing short of terrifying). I was so impressed with Sunshine's wild spirit and her natural ease in the water I immediately adopted her as my goddaughter. With each river visit Emma began to release her fear. These days she confidently moves around in the water without her glasses - and as a consequence has so much more fun with the natural jacuzzis that abound. Recently she's even begun to leap into the rushing current holding her buddy Sunshine's hand. Believe me, there are few greater pleasures in life than seeing somebody transcend the self-imposed limitations of fear. There's a huge lesson there for all of us: the less fear we carry the more joy we'll feel. Emma and her Daddy, my ancient classmate John Puracal. My golden boy, Mr Wong Beng Oi, loves Emma and Sunshine too. Your versatility with words is still... breathtaking! I discovered in u a kindred spirit forty years ago. I'm amazed that each visit to the River keeps nurturing this bond.. I understand why Emma and Hsing Shan make it a point to 'reinforce' their friendship chez toi each time they meet...there is indeed something magical about Magick River and its ambience! Lurvely girls! Good to see Wong Beng Oi is as humsup as ever! The old reprobate! Ha ha! Love that dog! I remember how he asked for a backrub by sliding his chunky body under my feet while I was sitting! Need to know something pls. Is the bungalow ready for rental if I were to come with, say, 20 over friends? Is there sufficient space to camp outdoors for those who prefer to sleep under the stars?